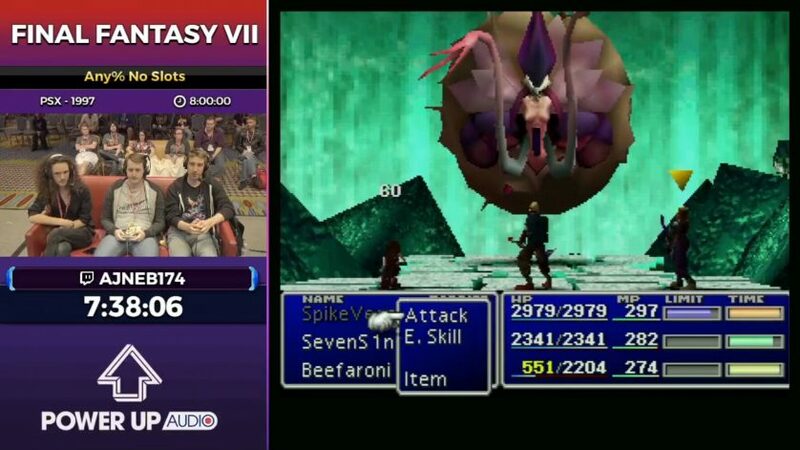 In this guest article, cold_spirit takes a look back at Final Fantasy VII’s incredible speedrun at Summer Games Done Quick 2017. Games Done Quick (GDQ) is a semiannual, weeklong charity event that raises money for organizations such as Prevent Cancer Foundation and Médecins Sans Frontières (Doctors Without Borders). The addition of FFVII into this year’s lineup is noteworthy due to run’s length. 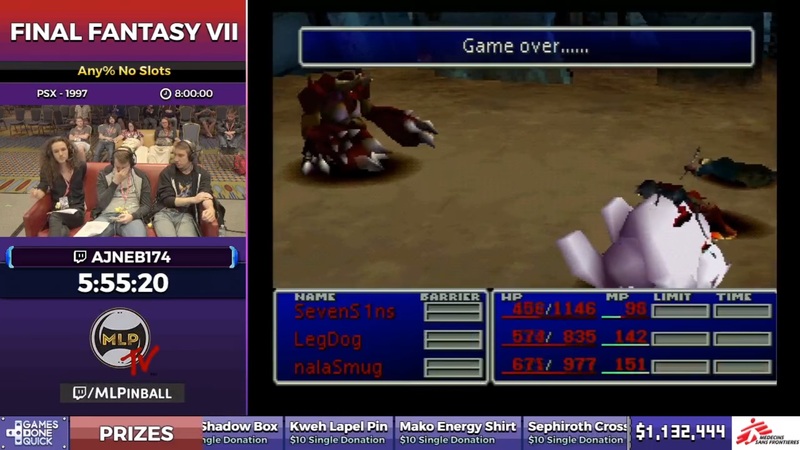 With a final time of 7:48:04, FFVII takes the record of being the longest single-session run in GDQ history. Lengthy RPGs such as FFVII are typically avoided during speedrunning marathons in favor of shorter, more action-oriented titles. This year, however, GDQ committed to shining the spotlight on longer runs to give them their due chance. Described in the pre-show as the “trifecta of JRPGs,” the three games chosen to meet this commitment were Chrono Trigger, Earthbound, and Final Fantasy VII. Speedrunning community member KartSeven put significant research into mapping a route through the entirety of FFVII in order to ensure the run was “marathon-safe”. With speedrunner Ajneb174 at the controller and couch commentary from Davesterio and J2_JATWo, the run took place through the wee hours of the night (local time; the event was held in Minneapolis, MN) to a consistent audience of over 100,000 Twitch viewers. FFVII was played under the game’s “Any% No Slots” category, meaning the runner had to reach the credits without the use of Cait Sith’s Slots limit break to one-shot bosses. Donation incentives were made available beforehand to add a bit of flavor to the night. This included a bid war over what to name the game’s mandatory characters and whether to end the run in style by unleashing Omnislash in the final battle. I’ll forever remember the swift adventure of SpikeVegeta and his fateful encounter with the flower girl COOLRANCH. The commentators deserve a huge shout-out. Together they ensured this 8-hour run would be without a dull moment by offering informative, yet down-to-earth explanations on FFVII’s mechanics and story. During the Wall Market sequence, the commentators even led the live audience through a squat routine in tandem with Cloud, perfect for combating the need for sleep. The couch also had the nerve to pull a practical joke on viewers by pretending Ajneb174’s self-inflicted party wipe – pictured below – was an accident, overreacting and asking each other how long it’s been since their last save. I totally didn’t fall for it (just kidding, yeah I did). The true VIP of the run has to be the runner himself, Ajneb174, who memorized the locations of all of FFVII’s random encounters. Full stop. Take a moment to mull that over. You see, FFVII’s encounter rate isn’t actually random at all. Well, not if you refrain from turning off the console or reaching a game over. It is possible to memorize exactly where Cloud will encounter a battle and whether that battle will be a pre-emptive strike. By keeping track of Cloud’s steps and ensuring that you run or walk at specific moments, the runner can manipulate to a powerful degree what battles they face. Most notable is the double Stinger Skip in the Cave of the Gi. By maintaining a perfect step count throughout the run you can trigger a random encounter on the same frame you move through the spider’s web, skipping both battles. Now imagine doing that twice in a row. Absolutely insane. If you only watch one minute of the run I suggest it be this one. A hilarious side note is when the commentators encouraged all Twitch users to ready their doge emotes for the emotional scene where Red XIII learns the truth of his father. The community came through and the number of Twitch emotes peaked at 1,410 emotes per minute, the max throughout the run and 7 times the average. You can view all the data collected on FFVII’s run and other games here. Games Done Quick is an amazing event that brings out the best in our community. I encourage everyone interested to tune in this winter for Awesome Games Done Quick 2018 and, of course, donate if possible. Thanks to all the people who make GDQ possible and all fans of Final Fantasy.